St. James' Court, A Taj Hotel, London is a slice of the past served on a contemporary platter, perfectly placed between Buckingham Palace and the Houses of Parliament in Westminster. The Changing of the Guard is about as British as taking Afternoon Tea with us or fish and chips on the beach! It takes place at Buckingham Palace, which is just a 6-minute walk from the hotel. A formal ceremony in which sentries providing ceremonial guard duties at important institutions hnad over the responsibility for protecting Buckingham Palace to a different set of sentries. London is one of the worlds most famous and best places to see a variety of great shows, featuring anything from musicals, comedy, drama and children’s theatre shows. We are fortunate to have three amazing theatres within 5-minutes walk from our hotel. Why not see the incredible multi Tony Award-winning Broadway musical Hamilton at the Victoria Palace Theatre. Or would you rather be dazzled with Wicked Musical? A smash-hit musical about The Wizard of Oz, showing at The Apollo theatre Victoria. You can also head to The Other Palace Theatre, where the programme consists of full productions and festivals of new work. London’s famous Theatreland is just a short taxi ride from us or take a stroll to St James’ Park. With an array of over 40 theatres showing world-class performances means that whatever you fancy, you’ll be spoilt for choice! Before heading to a show, why not experience our Pre-Theatre menu? The Victoria and Westminster area of London homes an eclectic mixture of traditional buildings set against very modern architecture. Home to a host of acclaimed restaurants, bars and cafes from some of the food industry’s biggest talent, Victoria is increasingly recognised as London’s vibrant new food quarter. Discover the new restaurants at Nova Food, try the Grab & Go options for busy people dining al-desko, experience great restaurants for all tastes and budgets, or plan your night out in one of Victoria’s fantastic bars. Cardinal Place is home to one of London’s most exciting food markets, featuring a multitude of traders from across the UK and beyond. Taking place every Thursday lunchtime, from 12-3, the market offers a huge range of quality hot and cold food, including traditional fish and chips, empanadas, paella, crêpes and much more. Love art? Enjoy an array of artwork at CAMA Gallery, (Contemporary And Modern Art), a registered international institution that has been formed in response to an increasingly global demand for Iranian artistic production. Visit Westminster Cathedral, located just around the corner from us. It was built in 1903 and its striking architecture is worth a visit. Located In the heart of London, it has occupied a unique and enviable position at the forefront of English church music. Fancy watching a film? Visit Curzon Victoria with a unique mix of film and cultural events with carefully selected wines, local beers and spirits in their beautiful lounge bars. 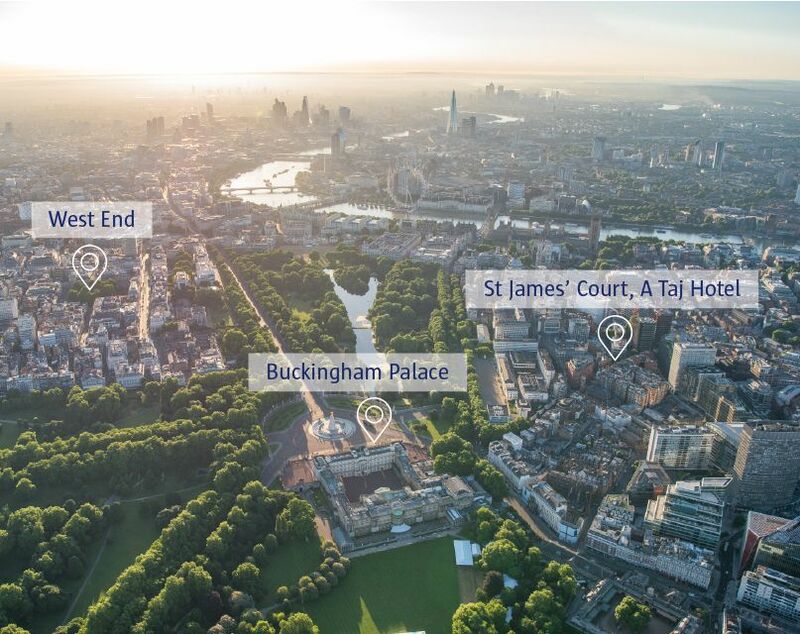 Do you know that we have three of the Royal Parks within walking distance from our hotels? St. James’ Park is on the doorstep of our hotel, Green Park is right next to Buckingham Palace and just a few minutes further up is the famous Hyde Park and Kensington Palace. We encourage you to take this opportunity and enjoy refreshing walks exploring the natural beauty of these parks. Whilst you’re here, why not pick up a picnic from our hotel for your partner or your family? Contact our Concierge who would be delighted to organise some delicious treats for you to enjoy. Introducing our New Bedrooms and Suites. If you’re after a luxury experience, we would suggest considering our newly refurbished Premium Rooms based in Almoners Townhouse. They boast the perfect blend of heritage and contemporaneity; Taj’s historic design features marry with a bold, contemporary finish, reminiscent of a modern townhouse. The use of pale hues accentuates the abundance of natural light, giving the new rooms and suites a bright and airy feel that ultimately creates a light and welcoming environment. A great choice if you want to impress your other half or treat yourself to just a bit of extra luxury.